The European Union is ready to negotiate opening its markets wider to U.S. imports including cars in a bid to stave off a potential trade war with Washington, EU leaders said on Thursday. U.S. President Donald Trump has imposed import duties of 25 percent on steel and 10 percent on aluminium on grounds of national security but has granted EU producers an exemption until June 1 pending the outcome of talks. 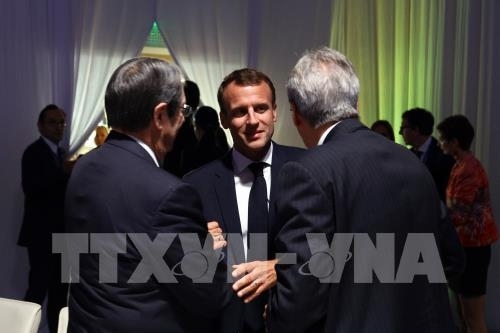 EU leaders meeting at a summit in Sofia sought to find a common stance, balancing the interests of those such as Germany who are most keen to avoid a trade conflict and those including France most determined not to be bullied into concessions. “We have a common position. We want a permanent exemption and then we are ready to talk about how we can reciprocally reduce the barriers to trade,” Merkel told reporters on Thursday. EU diplomats say the need to find a unified stance goes beyond just tariffs. The United States has withdrawn from the Iran nuclear deal, posing a threat to European companies doing business there, and has blocked appointments to the World Trade Organization, undermining its ability to settle trade disputes. EU leaders agreed on four areas on which the bloc would be willing to open talks with the United States, but only on condition that Washington grant EU steel and aluminium makers a permanent exemption from tariffs. “We seek solutions. It is possible, there is room. The agreement yesterday on four points gives some kind of space for talks,” Lithuanian President Dalia Grybauskaite said. The areas identified for cooperation are market access for industrial products, including cars, and government tenders, energy - notably liquefied natural gas (LNG), possible cooperation on regulations, and reform of the WTO. “These talks will be based on the principles of reciprocity and WTO compatibility and with the objective of avoiding a trade war,” an EU official said. Trade ministers are expected to discuss the issue at a meeting in Brussels next Tuesday. The European Commission, which oversees trade policy for the 28 EU members, has said it would respond to tariffs with its own duties on U.S. products, including motorcycles and whisky. To keep this possibility open, it published a draft law on Thursday to allow it to impose 25 percent tariffs on a range of U.S. imports from June 20 and tariffs of up to 50 percent on imports from March 23, 2021. It will notify the World Trade Organization of its potential plans by Friday.